Atlanta is the sprawling capital of Georgia. It played an important part in both the Civil War and the 1960s Civil Rights Movement. Atlanta has been dubbed everything from the "capital of the new South" and "the next international city" to "the best place to do business." It's also a great place to visit. Fueled by the prosperity of local mega companies like Coca Cola, Delta Airlines and Holiday Inn, the prestige of hosting the 1996 Summer Olympic Games and the energy of young upwardly mobile types who have migrated to the city in droves - Atlanta is on fire. And this time it's a good thing. From world-class restaurants and a myriad of cultural attractions to a hip nightlife and sporting events galore, the city is cosmopolitan in every sense of the word. But Atlanta has also managed to maintain its historic character. Stop by the Atlanta History Center or visit the Martin Luther King Jr. Historical Site, a moving tribute to an American icon. Browse through the former home of famous author Margaret Mitchell or pop into the Jimmy Carter Library and Museum for details on the life and times of the former president and his family. 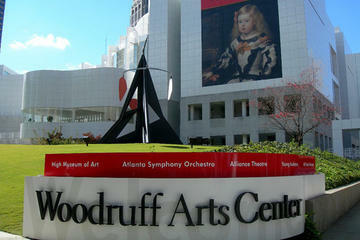 Whether you choose modern urban endeavors or old southern pleasures, Atlanta will not disappoint. One of Atlanta’s major showstoppers is the Georgia Aquarium, a colossal facility billing itself as the world's largest aquarium. The aquarium’s 8 million gallons of marine and fresh water is home to more than 100,000 animals representing 500 different species. 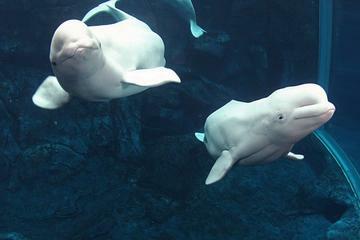 The aquarium's notable specimens include four young whale sharks, two beluga whales, and two manta rays. The five permanent exhibits, each with its own habitat, will surely enthrall. Within these displays are Australian weedy sea dragons, giant Pacific octopus, Japanese spider crabs, otters, and piranha. There’s even a petting tank where visitors can touch horseshoe crabs, sea stars, stingrays, and shrimp. Take a walk through an acrylic tunnel, surrounded by water, and watch as gigantic whale sharks swim overhead. 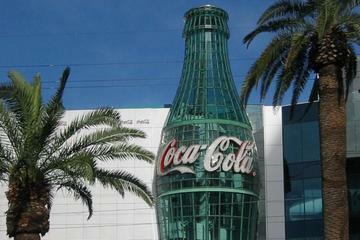 Celebrating the world’s most popular soft drink, the World of Coca-Cola showcases all things Coke. The museum is an absolute must-see for every visitor to Atlanta. The highlight of the visit is sampling Coke products from around the world. But there are also Andy Warhol pieces to view, a 4-D film to catch, company history to learn, and what seems like 20 billion promotional materials to behold. The World of Coca-Cola is divided up into two levels, called “The Hub.” On the lower level, a short film introduces visitors to the magic behind a bottle of Coke. After watching the film, visitors can browse a number of attractions, including the Milestones of Refreshment exhibit, which traces the history of Coke. When Margaret Mitchell wrote her epic, Pulitzer Prize-winning, romantic novel, Gone With the Wind, she didn't do it from a desk at a picturesque country cottage or a sprawling Victorian-era mansion. Instead, she wrote the novel that would be turned into one of the greatest movies ever made from a tiny apartment on the first floor of what was then known as the Crescent Apartments. The Tudor Revival-style home with red brick and white trim served as Mitchell's home from 1925 until 1932 and is today listed on the National Register of Historic Places. The site is known as the Margaret Mitchell House and Museum. 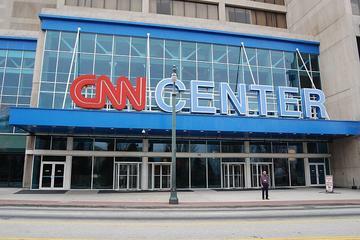 The Atlanta CNN Center is the headquarters of the cable-TV news service. A visit here will give you a behind-the-scenes glance at the 24-hour news organization in high-tech action, including a visit to production areas not accessible to the general public. Your first stop at the Atlanta CNN Center is in the lobby, where you can have a videotape made of yourself while reading news stories from a CNN anchor desk. Next, you’ll learn about the history of CNN through interactive kiosks and CNN memorabilia. In the special-effects studio, see how global news is produced via modern technology. The High Museum of Art, Atlanta’s stunning temple of visual treats, is hard to miss. First, the building is built of white porcelain tile, and inside are four floors of galleries strung together by semicircular pedestrian ramps surrounding a sun-filled four-story atrium. And that’s just the building. The High Museum of Art collection itself holds more than 11,000 works of art, including a stellar collection of American art, which includes fascinating works from the turn of the 20th century, plus contemporary pieces from the likes of Gerhard Richter and folk art from Georgia treasure Howard Finster. You can also see a marvelous collection of Italian paintings and sculptures from the 14th through the 18th centuries, as well as paintings by French Impressionists and German Expressionists. The collections of sub-Saharan African art and works by noted 19th and 20th century American and European photographers are also world-class. Home to the world’s largest gray-granite outcropping, Stone Mountain Park is a major recreational in Atlanta, with 3,200 acres (1,300 hectares) of wooded parkland and lakes. 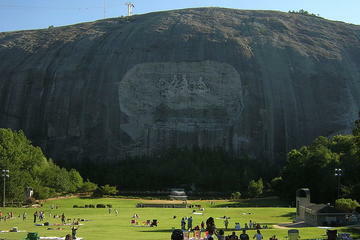 The center of the park is Stone Mountain, which is an enduring monument to the Confederacy. 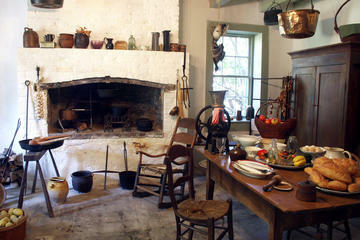 The park also has a Civil War Museum, a restored antebellum plantation, and loads of activities for the entire family. To learn about the history of Stone Mountain Park, stop at the Discovering Stone Mountain Museum, where exhibits take you on a chronological journey. Then, of course, is the mountain itself. The mountain is a site to behold from its base, but from the top are breathtaking vistas of Atlanta and the Appalachian Mountains. You can walk to the top via a trail, which takes your though moss-covered slopes, or take the Skyride cable car. There’s also a Sky Hike, which treks through the treetops.